What metrics should we use to assess the financial attractiveness of a product development project? What metrics should be used for ranking the projects we are in the process of conducting? Commonly used metrics for assessing project attractiveness are NPV, IRR, break even time, projected revenue, projected profit, gross margin and project cost. PD-Trak provides tools to capture the necessary data to calculate and report these metrics, as well as forward looking, risk adjusted variants needed for project ranking. In any product development project, we spend money to develop the new product(s) and then we get money back through the sale of the new product(s). The projected/actual costs are captured on the Costs page of a project in PD-Trak. The profit generated through the sale of the new product(s) is captured on the Payback page. 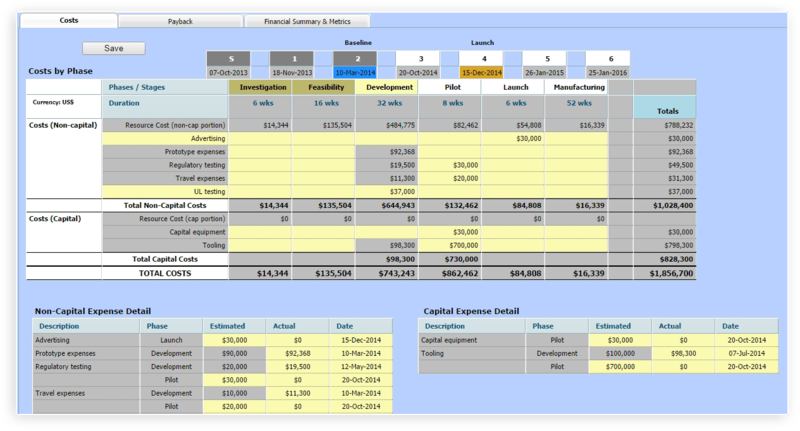 These two components are combined into the project cash flow on the Financial Summary page; the cash flow is then used to calculate the financial metrics. Expense estimates are captured at a high level in the early phases of a project and then developed into more detail as the project proceeds. The Costs page of a project automatically calculates human resource cost based on the entries made on the Resource Allocation page, based on standard resource costs entered in the central resource pool. Other non-capital and capital costs can be added to develop the overall project expense timeline. 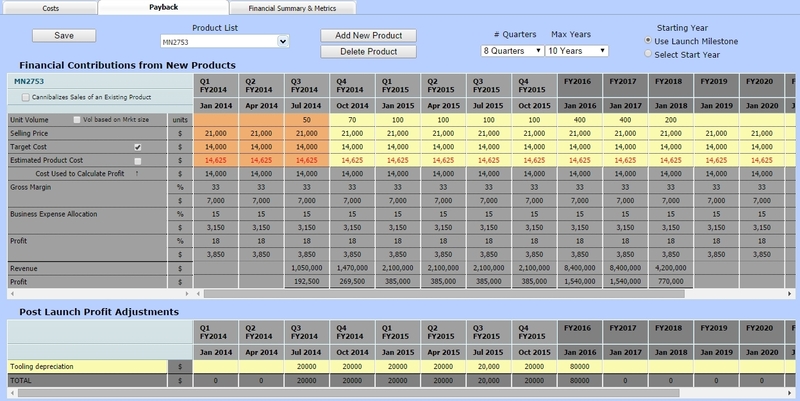 As the project continues the project manager can budget expenses on a more detailed basis using the lower tables on the Costs page, breaking down expense line items, indicating the planned date of the expense and replacing estimates with actual expenses. The Payback page is used to capture estimates of sales volume, selling price and target/estimated costs from which profit contributions are calculated. One table is completed for each product created by the project. Lost sales from existing products can also be captured, allowing metrics to be calculated with and without cannibalization effects. Note: This page is commonly customized for companies that want to use a specific financial model. Contact us for more information on this topic. The investment timeline is combined with the payback timeline to build the cash flow for the project. The cash flow is used to calculate essential metrics such as NPV, IRR and Break Even Time. PD-Trak is a multi-currency system. When the system is installed, the primary currency is defined. This is the default currency for all projects and portfolio reports. However, individual projects may be conducted in foreign/local currencies – the financial data is converted to the primary currency at the portfolio level. An individual resource can have its own unique currency and the currency will be converted to the project currency.